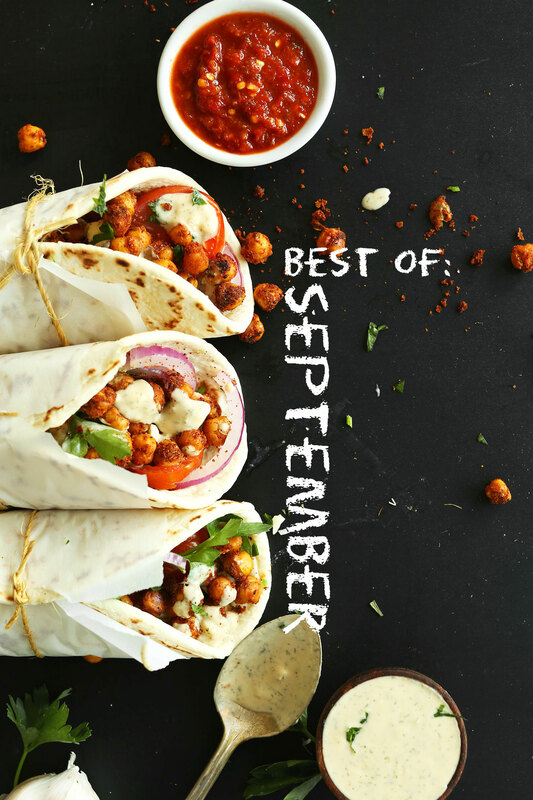 It’s that time of the month again where we recap everything we did, made (both food + resources), and ate in September. Can I just say this month was ridiculously delicious? I’m seriously proud of the work we did in September, especially in the food department. In case you missed any of it, let’s kick things off with eats! Of all these beauties, I have to say my favorites were the Vegan Truffles, Vanilla Bean Coconut Ice Cream, and Vegan Whoopie Pies. Surprised by my sweet tooth? I’m not. What about you? What was your favorite recipe this month? Tell me in the comments! I’d love to know. In the last couple months, we’ve added several new food resources, all of which you can find in the sidebar under the tag “helpful how-tos.” Be sure to check them all out, including our latest additions: How to Make Cauliflower Rice, How to Make Magic Shell, and How to Make Date Caramel. We also created several new recipe round-ups, including 17 Vegetarian Pasta Dishes, 16 Delicious Vegan Ice Cream Recipes, and 15 Amazing Vegan Dinners. This month, we hosted my dad for a week, and it was so much fun. We took him to several of our favorite Portland spots, all of which you can find in our Portland Dining Guide. We also ventured out to Cannon Beach, Multnomah Falls, and stuffed him full of ice cream before he left. Dads are kind of the best, no? We were also hard at work tying up all the loose ends on our print cookbook (eep!!!). It feels so good to have it almost ready for you guys to look at. It’s taken longer to complete than we anticipated, but that’s because we want every element of the book to be perfect. Stay tuned for PRE-SALE details very, very soon! Is it any surprise? 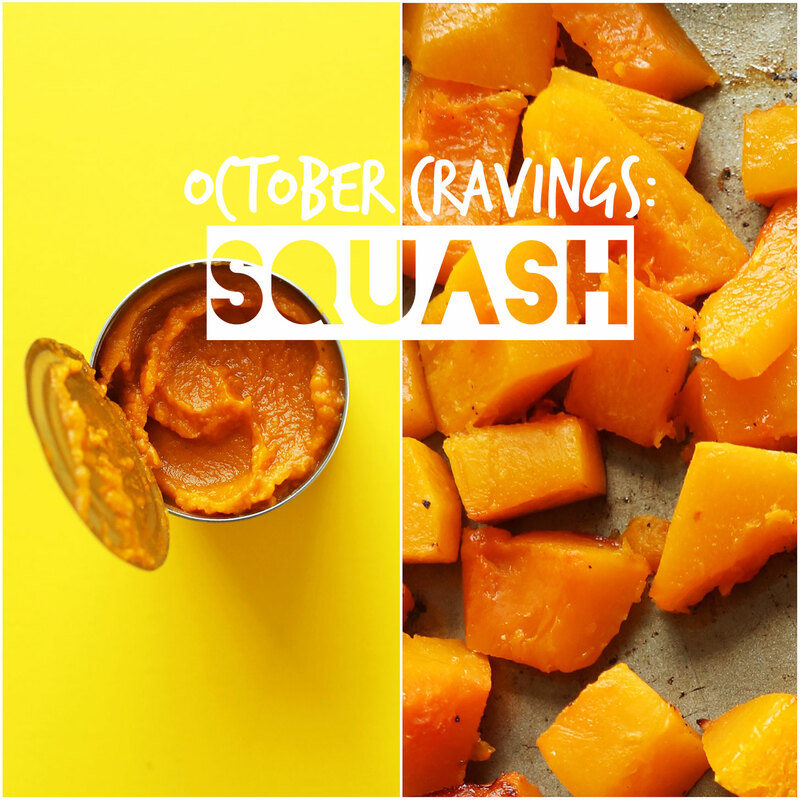 This month it’s all about the squash, especially pumpkin and butternut. I can’t help myself. Expect a mix of savory and sweet from Minimalist Baker in October, with an emphasis on fall-appropriate goodies that are perfect for entertaining, fall parties, and the holiday season! See you back tomorrow for a new recipe, lovelies. I made your date Carmel, what a treat me and my kids loved it…I can’t wait to try more of your recipes out!! My sister gave me the recipe and I’m dying to try all of your recipes!!! HI,MY NAME IA SOMAYEH,I’M FROM IRAN,I LOVE YOUR SITE VERY MUCH,ADD I LEARN SO MANY Delicious RECIPE FROM YOUR SITE. I JUST WANT TO SAY THANKYOU. I love your site!!! Everything I make turns out great! I’ve been scared to try vegan meatballs but after reading the reviews for the sundried tomato and basil one, I decided I would try! Yay, a printed cookbook! I was wondering, since you guys made your dinner guide earlier as an e-book if you guys were ever going to make another cookbook, in print! I love your blog and have had many successes in the past. Can’t wait for dem deets! Oh, you must! Let me know how it goes, Elizabeth! ps… He would have them with strawberries and raspberries mixed in followed by avocado on toast, so it’s not just a fuel-less breakfast! I absolutely LOVE your site. It’s my go-to, fave food blog on the entire web. I can’t wait for your print cookbook. When is pre-order? I’ve added the chocolate rice krispies cereal to my list! Great idea! Hell yessssss am I craving squash! Do NOT forget pumpkin! My sister and I tried your date caramel too……it did not last long! Great list. You know what kind of list I’ve been looking for but can never find? “Husband-Satisfying Vegan Suppers (that don’t include Buddha bowls, don’t require 20 ingredients, and don’t require 2 hours to prepare!)”. Any ideas? 3 cheers for the turmeric chickpea fritters! Yay! Glad you liked them, Gail! So many fantastic recipes! I don’t know which ones to try first! I made the ramen – it’s delicious!!! My husband says thanks! Yay! Thanks for sharing, Kay! Yay for a cookbook and all sorts of squash! Happy fall! Chickpea fritters and date caramel look so yum… Need to try to make them asap! I love seeing all of the month’s recipes in one spot. They’re so beautiful! I’m so excited about all the October deliciousness to come! I made your chickpea fritters last night and they were amazing drizzled with yogurt sauce. Can’t wait your print cookbook to hit shelves. 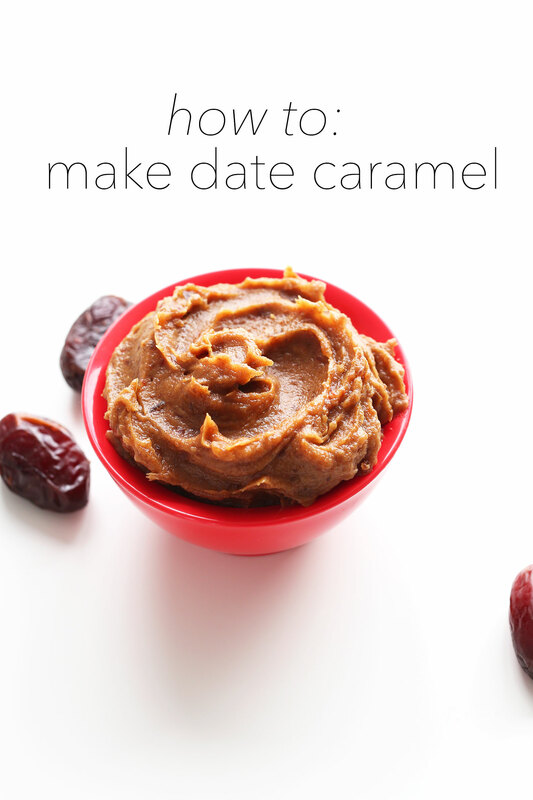 I’m in love with the date caramel! 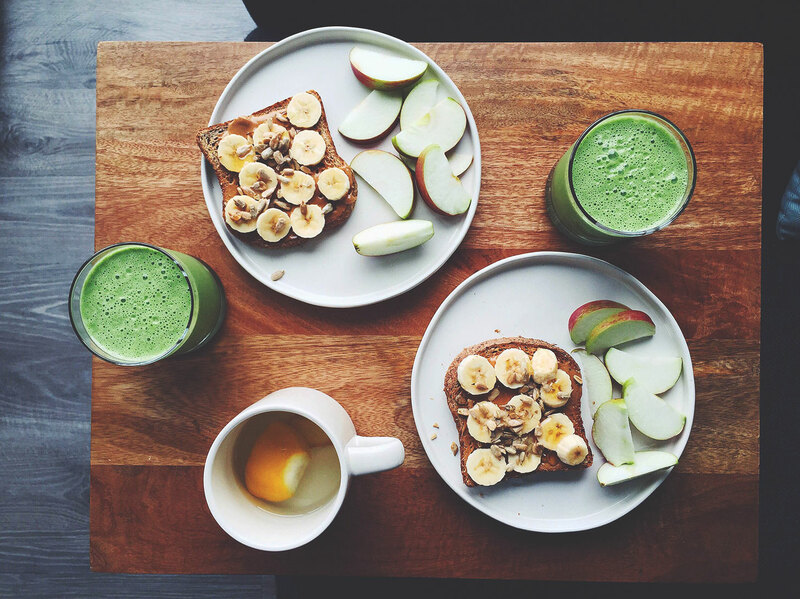 So delicious..especially with apples! Yay! Glad you both liked it, Tom! Thanks for sharing! Ha! Yes! Details coming soon!